"We're not in the business of failing; we're in the business of winning. 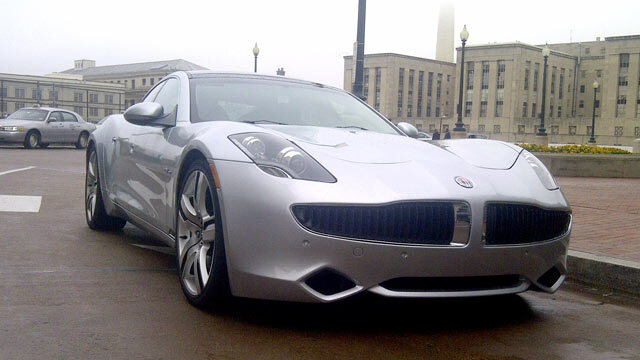 So we make the right decision for the business," Fisker said. "That's why we went to Finland." An investigation by ABC News and the Center for Public Integrity's iWatch News found that the DOE's bet carries risks for taxpayers, has raised concern among industry observers and government auditors, and adds to questions about the way billions of dollars in loans for smart cars and green energy companies have been awarded. Fisker is more than a year behind rolling out its $97,000 luxury vehicle bankrolled in part with DOE money. While more are promised soon, just 40 of its Karma cars (below) have been manufactured and only two delivered to customers' driveways, including one to movie star Leonardo DiCaprio. Tesla's SEC filings reveal the start-up has lost money every quarter. And while its federal funding is intended to help it mass produce a new $57,400 Model S sedan, the company has no experience in a project so vast. There is intense scrutiny of the decisions made by the Department of Energy as it invests billions of taxpayer dollars in alternative energy. The questions come in the wake of the administration's failed $535 million investment in solar panel maker Solyndra. The company's collapse, bankruptcy and raid by FBI agents generated a litany of questions about how the Energy Department doles out billions in highly sought after green energy seed money. READ the Energy Department's defense of the auto loan program. READ Fisker's response to the ABC News report. In interviews, executives with Tesla and Fisker said comparisons to Solyndra are unfounded. Each said the government's investments will ultimately pay off by supporting a fleet of electric cars that will ease the nation's dependence on fuel and benefit the environment. "It's absolutely a worthwhile risk," said Diarmuid O'Connell, vice president of corporate and business development for Tesla Motors. "I absolutely believe it was a good bet for American taxpayers." Tesla has said its mass production of the sedan will ultimately lead to profitability. Henrik Fisker, the renowned auto designer who founded the car company that carries his name, said his company holds tremendous promise and has accumulated $600 million in private financing. When asked directly by ABC News if taxpayers should worry about the more than $500 million in federal funds on the line, he was emphatic: "No, I don't think they need to worry about it," Fisker said. When asked if Fisker might be the next Solyndra, he said, "Absolutely not." 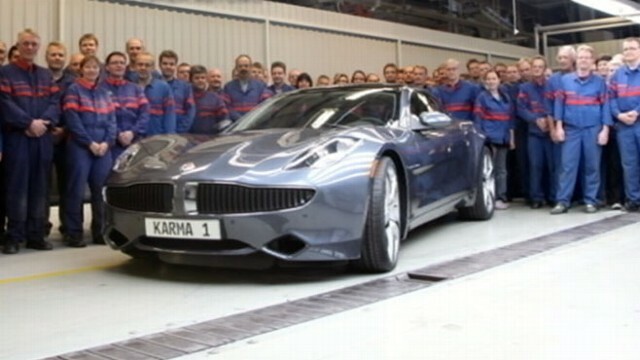 In a lengthy interview, Fisker said he apprised the Department of Energy of his decision to assemble the high-priced Karma in Finland after he could not find an American facility that could handle the work. They signed off, he said, so long as he did not spend the federal loan money in Finland -- something he says the company has taken care to avoid. He said the decision, ultimately, was to help prevent his company from following the path of Solyndra, which exhausted nearly all of its loan money on a high-tech solar manufacturing plant in Freemont, California. "If you just start doing like what Solyndra did, making a factory in a place where it was too expensive to manufacture … [you] obviously fail," he said. By some key measures, Tesla is ahead of Fisker. More than 2,000 of its first electric car, the Tesla Roadster, are on the road, while Fisker is just starting to get its first car into showrooms. And Tesla is further along in advancing a second, lower-cost car, the Model S. While both firms boast of big dollar private investments, Tesla's vulnerabilities are more publicly visible through its SEC filings, in contrast to the privately held Fisker. Chelsea Sexton, a 20-year veteran of the electric car movement and an outspoken advocate for alternative fuel vehicles, said she can plainly see the risks, even though her husband works for Tesla. "None of us with any experience in the industry think there's any sort of guarantee they'll make it," Sexton said of Tesla. "It looks pretty good right now, they're building out their plant, things seem to be on track, so we're all encouraged. But you know, we watched GM and Chrysler go bankrupt." Energy Department officials said such loans, by their nature, are risky because the department is financing innovative, potentially game-changing technologies that could deliver long-term benefits. They said neither firm has missed a loan payment, or sought help from the department to restructure their lending agreements. "Two years ago, critics said we shouldn't be investing in American auto manufacturing at all because the industry wouldn't survive," said Damien LaVera, an Energy Department spokesman. "They were wrong then and they're wrong today. From well-established names like Ford to innovative startups like Tesla and Fisker, America's auto industry is being reinvented. Continuing this turnaround demands more innovation, not defeatism. While supporting innovative technologies always carries a degree of risk, these investments deliver long-term benefits." Yet an audit this year by the Government Accountability Office, the investigative arm of Congress, criticized the Energy Department for not keeping close enough tabs on its fleet of auto loans -- including those to Fisker and Tesla -- to ensure they meet benchmarks. The funding was issued under the $25 billion Advanced Technology Vehicles Manufacturing loan program, one piece of a giant umbrella of DOE loans and loan guarantees going out the door. "DOE cannot be assured that the projects are on track to deliver the vehicles as agreed," said the GAO report examining the department's ATVM program. "It also means that U.S. taxpayers do not know whether they are getting what they paid for through the loans." Tesla and Fisker stand in rare company in securing the ATVM loans. To date, records show, more than 95 percent of applicants are still awaiting approval or have been rejected from the loan pool. Between them, Fisker, at $529 million, and Tesla, at $465 million, have secured nearly $1 billion to jump-start production of their cars. Combined, the companies have already drawn down more than $300 million, Federal Financing Bank records show. Industry watchers question whether the Department of Energy had the auto industry know-how to make an informed choice, and they worry that another government-backed failure could damage the very industry the program intended to help. "I think we'll absolutely end up having our version of Solyndra in the transport world based on the way the DOE has, and seems to still be executing its loan program without enough veteran diligence in the process," Sexton said. The majority of the DOE funding for Fisker is earmarked for the company to develop a less costly, mass market sedan, called Project Nina. Energy officials issued the loans for a car that, even two years later, has not been publicly revealed. "A half billion dollars for a car that no one has seen a picture of, in the Fisker Nina, was a bit more surprising to people," Sexton said. Fisker said the mass market car Nina has been designed and built, but it remains under wraps to maintain a competitive edge. Standing in a shuttered General Motors plant in Wilmington, Del., Vice President Biden proclaimed that a half-billion-dollar Department of Energy loan would transform the idled site into a production line for electric cars. "Folks, we're making a bet," Biden said on Oct. 27, 2009. "We're making a bet on the future, we're making a bet on the American people, we're making a bet on the market, we're making a bet on innovation." The announcement that the plant would re-open followed a heavy lobbying push by Delaware politicians from both parties, who cited the news as a sign of industry's turnaround. In September 2009, Republican Rep. Mike Castle wrote directly to Energy Secretary Steven Chu, saying the Fisker proposal had "great merit," and urging Chu to give the company "careful consideration" for the loan. The governor and state politicians took turns, along with Biden, to proclaim the project to cheering blue-collar workers clad in jeans, caps and jackets. They said it would produce thousands of jobs and have cars rolling off the line by next year. Fisker said he remains convinced those jobs will come. While he has hired marketing, design and engineering teams in the U.S., the auto plant jobs in Wilmington right now number about 100. The Department of Energy loan to Fisker closed in April 2010, and again Biden took center stage in a department statement announcing the loan. "The story of Fisker is a story of ingenuity of an American company, a commitment to innovation by the U.S. government and the perseverance of the American auto industry," said the vice president. ABC News sent questions to the White House Monday and requested an interview with the vice president. Biden was not made available, but an official in his office said "the Office of the Vice President did not encourage the Department of Energy to choose any particular company over any other but, like others in the Administration, supported the Department's loan program and the creation of car manufacturing jobs in the United States." Energy Department officials have been steadfast that politics never entered the picture and each project was screened by professionals and secured on the merits. And executives from Tesla and Fisker said they won government support because their projects had the best shot at success. They said the involvement of well-connected figures in their companies should not suggest they attempted to use special influence to secure the loans. Both companies have political heavyweights behind them. One of Fisker's biggest financial supporters, records show, is the California venture capital firm Kleiner Perkins Caufield & Byers. The firm financially supports numerous green-tech firms, records show. Kleiner Perkins partner John Doerr, a California billionaire who made a fortune investing in Google, hosted President Obama at a February dinner for high-tech executives at his secluded estate south of San Francisco. Doerr and Kleiner Perkins executives have contributed more than $1 million to federal political causes and campaigns over the last two decades, primarily supporting Democrats. Doerr serves on Obama's Council on Jobs and Competitiveness. Doerr has not replied to interview requests since March. "Their major venture investor is Kleiner Perkins, who has Al Gore as a partner and is certainly politically connected in general," said industry observer Sexton. "Whether that played a role or not is up to the DOE to explain." Tesla brings political pull, as well. A former Tesla board member, Steve Westly, is an Obama bundler who raised hundreds of thousands of dollars for the president in 2008 and for his 2012 re-election campaign. His Westly Group was also a financial supporter of Tesla Motors until Tesla went public in 2010, and Westly continues to back the company. Westly has declined interview requests since February, but has appeared in multiple conferences, forums and TV interviews publicly praising Tesla Motors. Tesla's founder and CEO, Elon Musk, is a hearty political contributor who has primarily backed Democrats, including Obama. According to published reports, another Tesla investor is Nick Pritzker, a donor to Obama and a cousin of Penny Pritzker, the national finance chair of Obama's 2008 campaign. O'Connell, the Tesla executive, said political muscle played no role in the company's award of the $465 million in loans, noting that the initial application was filed under Bush -- though landed under Obama. In Tesla's case, as in Fisker's, the government loan was broken into two parts. The first chunk, for $365 million, is to finance a manufacturing facility for the Tesla Model S sedan, Tesla's lower-cost answer to its pricey Roadster. The other $100 million funded a facility to manufacture battery packs and electric drive trains used by Teslas and other automakers, including the Smart For Two city car by Daimler. Tesla points to such partnerships - along with investments from Toyota and Panasonic - as signs that long established companies believe in its cars. "We have a demonstrated track record on the financial side," O'Connell said, "that should give great comfort to the American taxpayer, as they think about a loan that's helped us to accelerate our business model." Unlike Fisker, Tesla is a public company. Its SEC filings offer a more sober assessment of the obstacles it faces on the road to profitability. Tesla has yet to turn a profit and suffered net losses in each quarter. "Since inception and through the three and six months ended June 30, 2011, we had accumulated net losses of $522.8 million," its most recent 10-K form shows. It has no experience in high-volume manufacturing of electric cars, its filings say -- the very project it sees as the road toward profitability. Tesla said it encountered "significant delays" in launching the Roadster - and acknowledges that developing the Model S will be a more complex undertaking. The newer car is the project financed by DOE. "We have no experience to date in high volume manufacturing of our electric vehicles," Tesla's SEC filings say. "Our future business depends in large part on our ability to execute on our plans to develop, manufacture, market and sell our planned Model S electric vehicle." The Roadster was produced in small quantities with the body assembled by Lotus in the United Kingdom and final assembly by the company at its facility in Menlo Park, Calif. The Model S, by contrast, will have much greater volume and be manufactured in Fremont, Calif. The company said production will begin next year. Industry observers say Tesla's grand plan to launch the Model S is fraught with challenges. "They want to scale up production from 1,000 cars a year to 20,000 cars a year, [and] that's going to be a very hard trick for them to do," said Alex Taylor, a veteran auto industry analyst and writer. "They want to make most of their own parts; Detroit can't do that because it's too inefficient. And Tesla wants to own its own dealerships. Henry Ford tried that back in the 1920s and gave it up because it was too difficult." O'Connell said the SEC filings present worst case scenarios. He said the company, and its major investors, believe the risk will reap rewards. "It is a risky venture in the best heritage of some of the other great companies that have grown up in the Silicon Valley," he said. "This is a place where people propose ideas, finance those ideas, achieve milestones, attract a greater finance, and succeed along the way."